As I reflect on the holiday known as Father’s Day, I am thinking about my relationship to food and my children. I desperately want to teach them things I know about food, and some things I think about food, which aren’t facts, but to me are just as important. There are two big goals for me: in teaching them to cook and prepare food, make sure I teach them to appreciate flavor, and to love food and foods for what they are. In doing this, I have thought a lot about how men relate to their children through food. In some cases, the kitchen and/or preparation of food is central to their relationship, as it is in the movie “Chef,” which I highly recommend to sentimental father-loving foodies. And in some cases, the father has almost no relationship to the food in the house other than paying for it, or carrying it in, like when he’s called upon to pick up the pizza or Chinese Food. Food does not have to play a pivotal role in child-rearing, but it has always been important to me. The worst condiment on earth: flavorless, formless and useless. Linus: How do you like the chocolate I made for you? Linus: (tastes it.) You’re right. I’ll go put in another crayon. 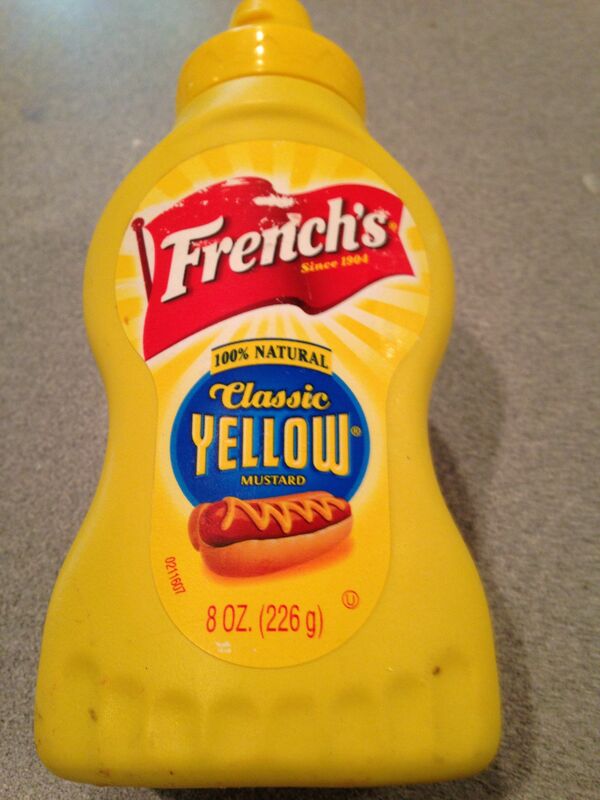 That’s all I can ever think of when I taste French’s. It tastes like a melted yellow crayon. It is a slimy, flavorless condiment that I suppose is used as a “starter condiment” for children who cannot tolerate flavor. For whatever reason, it continues to be the choice (the #1 mustard and #7 most popular condiment in the United States) for hot dogs and sausages around the country, and I suppose on Father’s Day, and all the rest of the summer BBQs it will be on hand to ruin some father’s fine and hard work at the grill turning out hot dogs, sausages, burgers, and the like. As for the other element—appreciating foods for what they are—that for me has really been the understanding that most of the best foods in the world don’t need too much ‘fixing.’ Certainly I have learned this from my Mom, and from my Wife and her family, but it is an important lesson for kids, and one that I think is completely obscured by people like Jessica Seinfeld (“Deceptively Delicious”) who advocate “hiding” or “sneaking” veggies into other foods like brownies for kids to eat. Why should I sneak “cauliflower” into brownies? My kids love cauliflower. Sure that took a couple of years to figure out how, but the alternative— where they eat lots of brownies later in life and wonder why they aren’t thin or healthy—seems absolutely tragic. When is Jessica going to tell her kids about the ol’ Switcheroo? How is that teaching kids to love food? Or love honesty? For me, I am going to keep being honest— which means adding all the bad stuff—salt, sugar and fat— to foods I make as long as those things are relatively organic (like butter or olive oil). I am going to make sure my kids know the difference between stuff that’s bad for them, like Sour Patch Kids, and stuff that’s not especially bad, but I don’t like (like French’s Mustard or Boston’s Bagels). As they start to work with me in the kitchen, I will happily teach them that you can easily and healthily make a grilled cheese sandwich without butter, but it just won’t taste as good. And as I typed this, my daughter was making a grilled cheese sandwich with lots of butter. She pronounced it perfection. So, to know that I’ve given her at least that one skill is probably the best Father’s Day gift I can get. Posted in Food Writing & Other Stuff and tagged "Chef"- The Movie, Father's Day, Fathers, Foodies, French's Mustard, Jessica Seinfeld on June 15, 2014 by Robert Deutsch.